Today: Bigger is better. Just to be clear -- we’re talking about citrus fruits. Pomelo’s botanical names -- Citrus maxima and Citrus grandis -- don’t leave much to the imagination: This is a big fruit. The largest citrus fruit, in fact. How big are they? They’re so big that pomelo hats are actually a thing, and in more reasonable size-comparison terms, you’ll find them ranging from extra-large grapefruit up to almost basketball-sized. 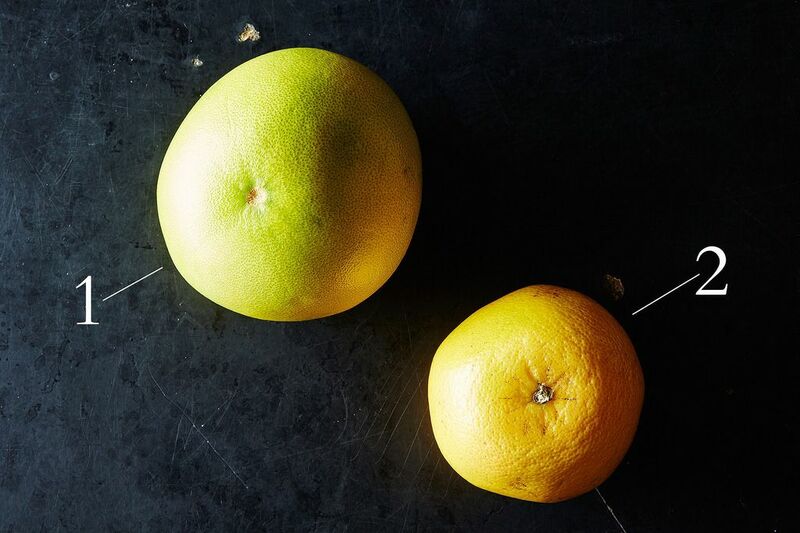 Scroll down for a visual: This pomelo (1, below) is fairly modest in size and it's sitting next to a large orange (2, below). The pomelo is one of the few non-hybrid citrus fruits. It's one of the parent fruits of grapefruit (the other is sweet orange), so you might guess that pomelos are tart. But pomelos actually don’t have any of the bitterness of grapefruit: They are quite sweet and very fragrant. If you can’t find them at your grocery store (they might also be labeled as pummelo or shaddock), try an Asian market. They can be round or more pear-shaped, wear a green or yellow peel, and have a wide range of colored flesh -- from whites and yellows through pinks and reds. It’s not just the peel and pith you’ll want to get rid of: You’ll need to remove the thick, bitter membranes (4, below) between the segments, too. If segmenting citrus fruit the traditional way seems intimidating, try a new way to do it -- neither are as onerous as it seems. And since pomelos aren’t as juicy as other citrus fruits, you might not even need to use a knife to cut away the membranes -- you can just peel them away with your fingers. More: If you want to save the peel for candying (and you should) take more care when peeling: Slice off the ends of the fruit, score the peel, and peel off the rind in large pieces. 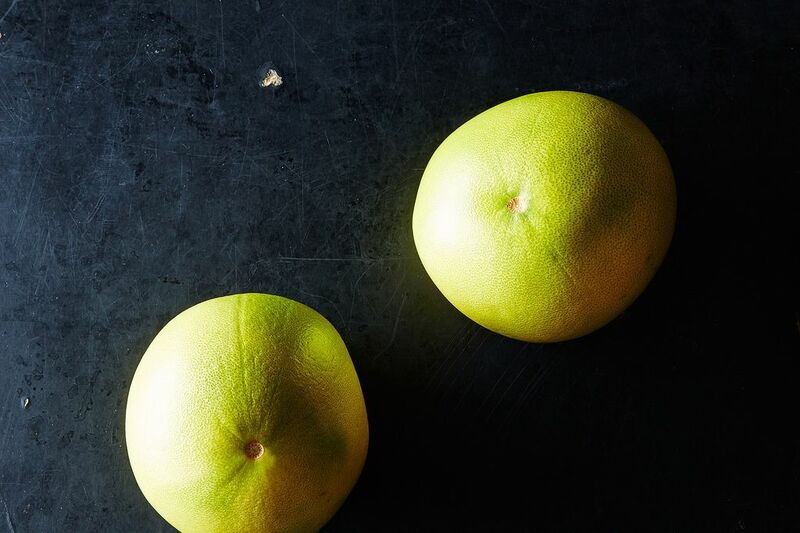 Pair pomelos with seafood, like swordfish or shrimp. Tuck the segments into crêpes, as our friends at Frieda’s do. Use the segments in a salad, and not just fruit salads -- green ones too. Drier pulp means you can often easily separate the individual juice vesicles for sprinkling over dishes, just as you can with finger limes. Juice them for your morning pick-me-up (or your 5 o'clock one). Use their juice in a citrus vinaigrette. 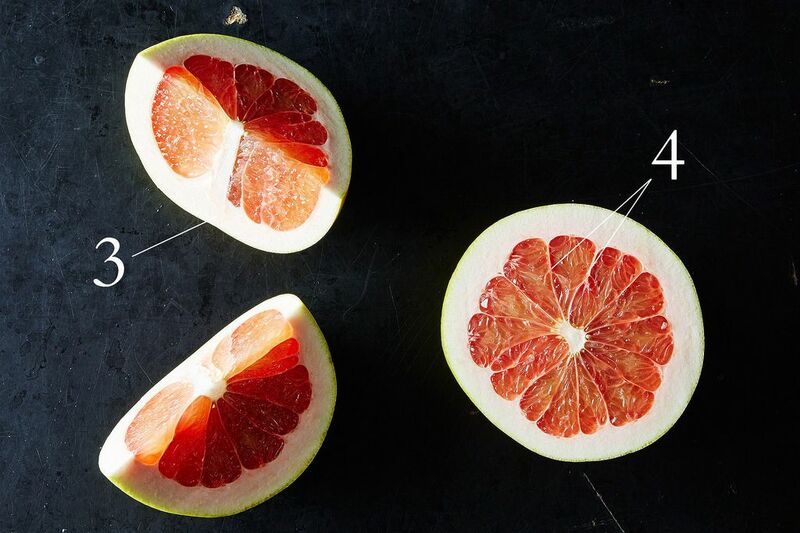 Skip the segmenting -- slice your pomelo in half horizontally, grab a grapefruit spoon, and dig in. Tell us: How do you like to use pomelos? We just eat it plain. We peel, take away the white thick part under the skin, and break into segments. Peel the outer membrane off and eat only the flesh inside. Nothing extra, no salt, nothing delicious! Do not eat the membrane of the individual segment it is utterly bitter. Bet the segments would be great broiled and served with caramel. i grew up in China and Thailand, and Chinese pomelos have white/pale yellow-green flesh and are much drier. do you know anything about that variety? i like the pink ones that I find here in the States too, but prefer the Chinese kind. The pomelos I've found have been drier and lighter in flesh color -- but I haven't seen them labeled by variety to know what I'm getting ahead of time before I cut them open. Unfortunately I think you'll find that to be the case most everywhere in the States (unless you live in California or Florida, where you might have a better shot), so I would try heading to your nearest Asian market. Or you might be able to order different varieties online, too. I love adding them to thai salads! So tasty and add freshness! Pomelos were the best on-the-go fruit when I was in Thailand last week! They like to sprinkle sugar and a little chile powder on top. Very refreshing snack. I eat them, plain, after peeling and sectioning. It's the best dessert, snack, breakfast, light lunch ever! My dear friend, Kathy, who is originally from Vietnam serves them in chunks over Jasmine rice with a simple warm soy sauce dressing- fantastic! I can't get enough Pommelos! Do you know what else went into her soy sauce dressing? I think I need to try that! We just peel the outer layer along with the inner thin white skin and after sectioning the fruit sprinkle a little salt and toss it with some green chilis and chopped cilantro. Makes for a very refreshing salad.